Desktop sharing helps to share the desktop with other computers, it works same like VNC server in windows. Last time i decided to install VNC server on Ubuntu to take a remote desktop from windows, i succeed by installing but unfortunately i am unable to take remote of desktop console (ie sharing the screen of the person who sitting directly on machine) because VNC server creates desktop sessions instead of sharing console desktop. I found a simple solution to enable sharing of desktop console. 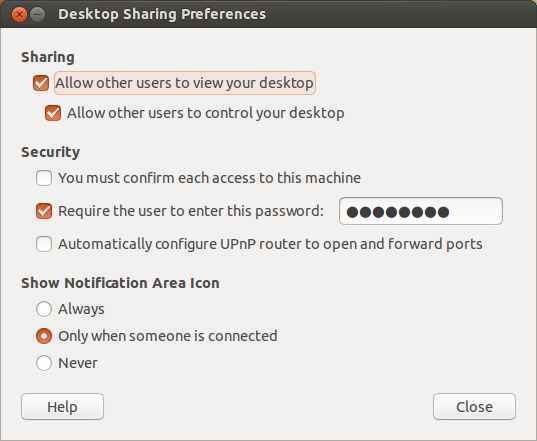 Desktop sharing has multiple advantages over VNC server. Allow or Disallow users to view desktop. Allow or Disallow users to control desktop. Here you can do all the settings that you want to secure your machine over network.